(1) Create a publication platform called Open Data Node that builds on results of previous research and development in the linked data field. Its mission is to bring results from research environment into real-world for people, SMEs and other organizations to use and re-use. (2) Create a methodology framework for easy use of technology in operating conditions of typical public bodies and rigorously tested for traceability, usability and sustainability in a public body environment. This is going to be verified in three pilot implementations during the project. End user-communities will be involved EU-wide to set a use case framework within which the requirements of heterogeneous organisations can be clearly understood. Provided feedback will be processed into the final methodology and recommendations for re-use applications. These two results will enable new applications to emerge – some of them will be directly created in the project by consortium members (search service by SPINQUE) or by associated bodies (Semantic Web Company, Austria). See also the project introductory presentation. It is a project ambition to lay the foundations for a data integration platform based on Open Data which will allow the re-use of data not only between public bodies and end-users but also among public bodies themselves: Public bodies can exchange information by using the same infrastructure and tools as end-users which will decrease costs of exchanging the data and in most cases also enhance the quality and speed-up of the exchange. What is even more important, OpenData APIs can be used by integration projects between public bodies, again saving costs and enhancing the quality of the resulting solution. This in turns strengthens OpenData publishing, with end-users benefiting again – a self reinforcing loop. What are the outputs of the project? publication of datasets as well as example applications using them. 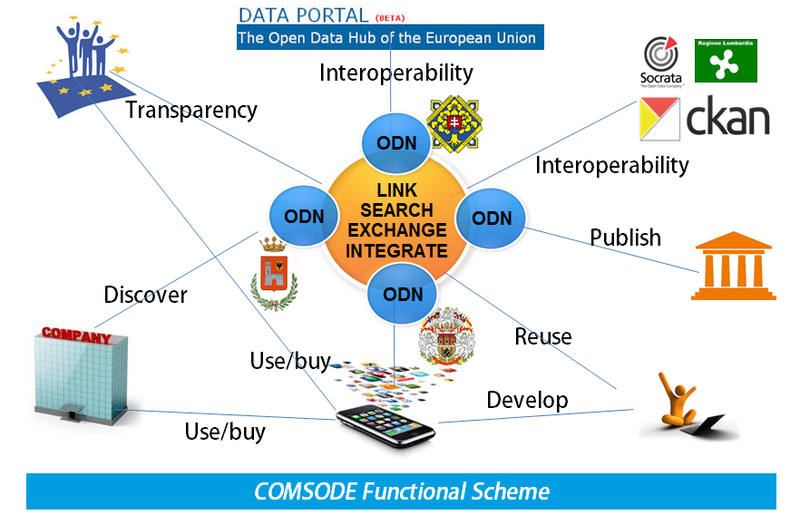 The tool “Open Data Node” (ODN) created by COMSODE will be free to use, free to modify and free to distribute. The second component – methodologies, teach organizations about Open Data best practices and show them how to use the Open Data Node (and partially other tools). And finally, COMSODE itself plans to publish 150+ datasets, using its own tools and its own methodologies (as well as several applications showing how to search through the data). The goal is to showcase that the technology works and how things may look when our software and best practices are both put into action. The COMSODE project consists of several “work packages” which have deliverables that could be useful. Some of them are more technical or detailed and could be of great help, especially to the technical users. We do not intend to introduce all the deliverables, only to provide a brief overview and choose a few documents that could be of particular interest. Work Package 2, “Architecture and design”, deals with collecting requirements for the creation of Open Data Node. Feedback from potential end users has been collected, so that the software fulfils all functional requirements. Also, criteria for the selection of datasets were compiled. Work Package 3, “Data analysis” focused primarily on the selection of the 150+ datasets published by the COMSODE project, as well as the technological details to make this happen (data transformation, cleansing, etc.). Work Package 4, “Development of software components and tools” is mostly about software development itself. Work Package 5 (“Development of methodologies”) is especially interesting to mention. Deliverable 5.1, “Methodology for publishing datasets as open data” is a methodology for publishers (mainly public bodies) about the steps and phases needed for publishing Open Data. It starts from the beginning of the publication activity (“what and why I must publish as open data?”) to the result (“we have dataset suitable for publishing”). This is a detailed catalogue of steps and activities that guide the organization throughout the publication process. Deliverable 5.2 is called “Methodologies for deployment and usage of the COMSODE publication platform (ODN), tools and data” and it’s more specific than Deliverable 5.1. Think of it as a manual for the tools that COMSODE provides. Finally, the intention of Deliverable 5.3 is to introduce the broader context of international Open Data standards and best practices. We wrote it to be an easy-to-read introduction for the various stakeholders. We want to paint the “big picture” (this in contrast to the previous documents, which are very specific) and point the reader to places where he or she can find more information. Deliverables 5.4 and 5.5 will be the final versions of D5.2 and D5.3, respectively, due on the last month of the project (September 2015).